Yes, I am a traveler! I have traveled around the Philippines. I have been traveling for the last 9 years or more. And I have been very meticulous in knowing the different tourist spots in the Philippines. But it took me 40 years to discover that there was an eco-park in our vicinity. It was a Saturday. My friends invited me to go to a nearby river in Tanauan City. I was glad to accommodate them in this hiking. It is located within our vicinity. I thought all along that we were going to the the Viva Mineral Water or the so-called La Tondena path towards the falls in Banjo West. And I was wrong. And so we hiked back to our real destination. The Balete Eco-Park. From Manila or Cubao, take a bus ride to Batangas (specifically, Tanauan-Lipa route, never ride the Calabarzon or Star Tollway). The fare is only P99.00. Travel time from Manila is only 1.5 hours. Alight at the road leading to Banjo East or Banjo West (known as 216 or Ramonita). And then, board a tricycle to Banjo West, the fare is only P13.00, unless you want to charter the tricycle for P80.00. The ride is good only for 10-15 minutes. Then, alight at the Balete Eco-Park. From the starting point, the trek is less than 15 minutes. Good thing the trail leading to the eco-park is cemented. But nearing the park, the road is no longer cemented but it is still a good trail. After 10 minutes, we reached the century-old Balete tree beside the river. I marveled at its height and size. I did not know that we have this kind of tree in our vicinity. And from the Balete tree, we continued our uphill trek for 5 minutes until we reached the Balete Eco-Park falls. And what a sight it was! We stayed at the site for half an hour and took our souvenir pictures. Afterwards, we went back to the Balete tree and took our merienda. It was really a surprise on my part to see the Balete Eco-Park. Good thing I did not hesitate joining the trip. Walled City of Intramuros - "A city within a city"
I spent my nine years of study inside this walled city. When I was a teenager, during my free time when I had no classes, I used to walk around the walled city and occasionally, watch the sunset while I was lying on my back on the top of its historical walls (I think the place was called "Parian"). Back then, I already knew the historical and cultural significance of this walled city. And never did I get tired of walking in its cobbled stone roads or looking at its enormous and historical structures. Intramuros was my second home away from Batangas. But after finishing college and law school, it took me years before I went back to this place. Sad to say, I was very much preoccupied with so many things that If I recall it right that from 1999 up to 2014 , I have visited the place for only 4 or 5 times(just to get documents from my alma mater). Imagine, being away for so long in what I consider my second home. Last January 14, 2014, amidst my busy schedule, finally I was able to go back and reminisce my glorious and wonderful years in Intramuros. I started from Rizal Park and traveled by foot and after 15 minutes, I was able to reach my destination. There were so many local and foreign tourists that day. 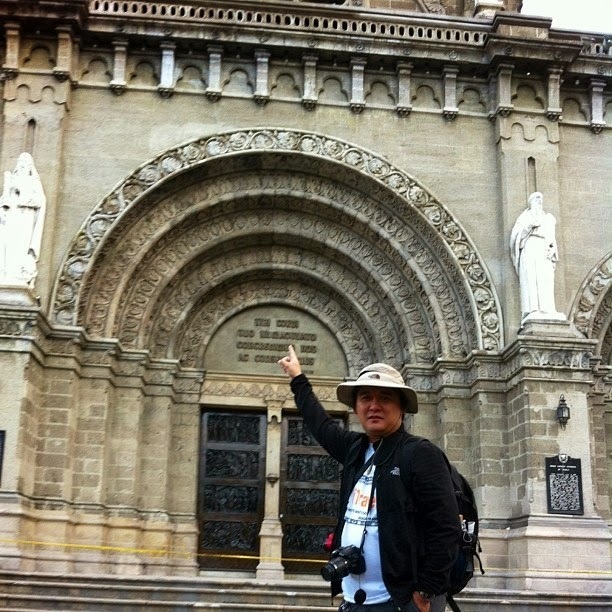 My first stop was the Manila Cathedral. I was not able to enter the church since it was under renovation and they say it will be open to the public on the Holy Week of 2014. Anyway, I have seen its interior a couple of times already and after taking some pictures, I decided to go to my next destination which was just a stone's throw the church. My second stop that day was visiting Fort Santiago. It is a national shrine and historical landmark. A priceless heritage of the Filipino people dating from the 16th century. A must-see place! By sheer accident, after years of idolizing this guy, finally I was given the chance of seeing, hearing and experiencing his tour entitled "Walk This Way" in Intramuros. 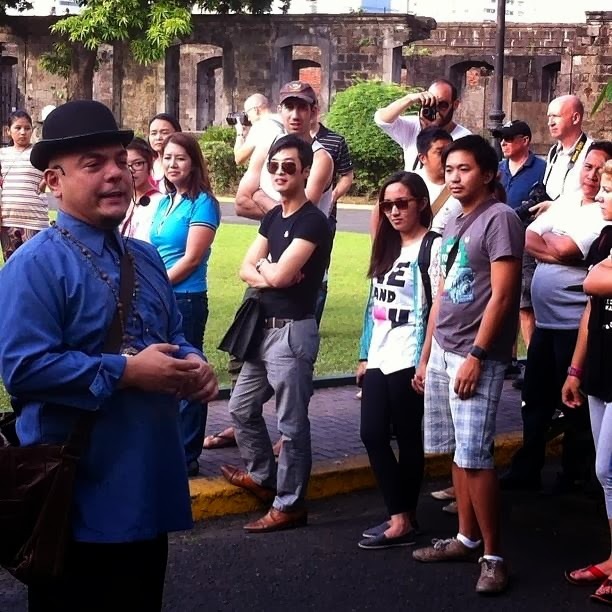 And the tour guide is no other than the famous Mr. Carlos Celdran! I love this guy! He is the best tour guide in the Philippines! It happened by accident. I was taking pictures of Fort Santiago and luckily for me, he was just starting his tour inside Fort Santiago and I joined the tour and watched the entire tour! It was one experience I would never forget. This tour will not be complete without seeing in action Mr. Carlos Celdran. Its a must see tour! You should not dare miss this one. And while you are inside Fort Santiago, never miss the opportunity of going to the upper deck of Fort Santiago and see Pasig River. After spending almost least 2 hours inside Fort Santiago, I decided to go to my last stop for the day. From, Fort Santiago, it took me less than 10 minutes before I reached the spot. One of the oldest churches in the Philippines. It is a world heritage site and one of the four Baroque churches of the Philippines inscribed in 1993 on the World Heritage List pursuant to the 1972 UNESCO Convention Concerning the Protection of the World Cultural Natural Heritage. After praying, I decided to go to my alma mater and rekindle my college days in Intramuros. 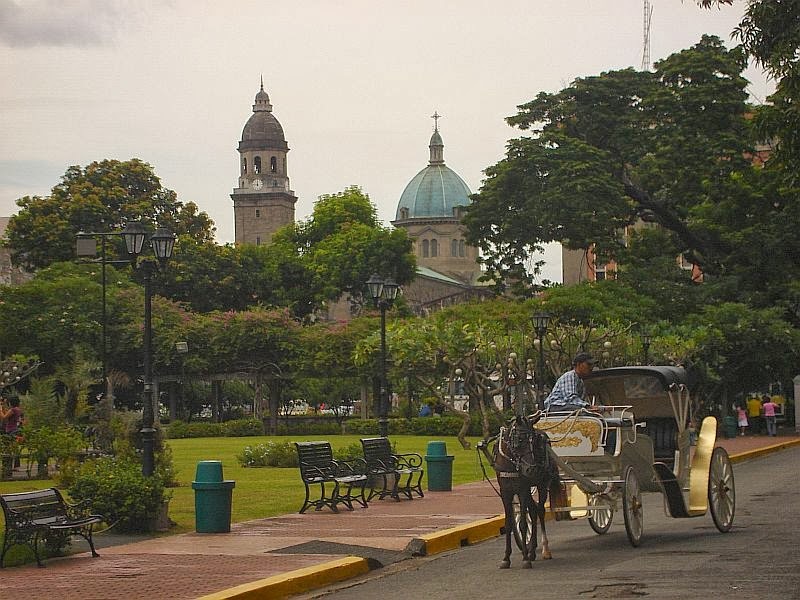 The majestic and glorious past of the Walled City of Intramuros, revisited. I have seen and visited the place so many times but this is my first time to take pictures of it and blog it.. 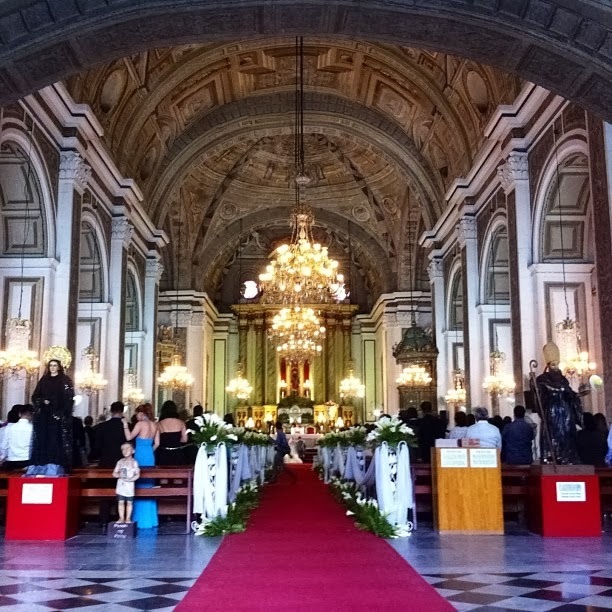 The first time I went here was when my uncle got married in Malolos, Bulacan in the late 90s. Then way back year 2007, almost twice a month, I would be going here to visit someone. Recently, last January 12, 2014, after paying a visit to someone, I roamed around the city and took pictures of the various tourist spots in Malolos. First spot to visit - the historical Barasoain Church. The church played a significant role of Philippine history. It is the place where the Revolutionary Congress convened in 1898 and where the Malolos Constitution was passed. A five minute walk from the Barasoain Church, Casa Real Shrine is part of one's tour of Malolos. It also played a significant role in Philippine history as declared by the National Historical Institute. The convent was the place where Gen. Emilio Aguinaldo held office as President of the the First Philippine Republic from 1898-1899. While I was hearing mass inside the Cathedral, I asked someone if there was another old church within the vicinity of Malolos and luckily, there was this church. I paid P40.00 for a tricycle ride from the Cathedral to this church and it was 10 minute ride . After seeing the church and praying for the third time, I went back home in Batangas. Formerly, it was called Bagumbayan during the time of Jose Rizal. Then, it became known as Luneta. Presently, it is called Rizal Park. It became famous because it was the place where our national hero, Jose P. Rizal was executed by firing squad during the Spanish regime (1898). Nowadays, it is the place of respite and leisure of Filipinos and one of the places included for foreigners in their Manila tour. I visited the place last January 11, 2013 and here are the places of interest worth visiting at the park. Built during the reign of President Ferdinand Marcos under the auspices of the National Parks Development Committee, it showcases the map of the Philippines. Jose M. Mendoza was the sculptor. Built on February 5, 2004 under the leadership of then Secretary of Tourism Richard Gordon. The statue was a gift form the Korea Freedom League as a token of appreciation for helping Korea during the Korean War to preserve democracy. It is the statue of Lapu-Lapu, the first Asian to withstand colonial forces. The Nayong Filipino Orchidarium is a place where photo and video shoots are made. It is open for reservation. It is also open for venue rentals. Contact Nos. - 0926-424-4263/ 0906-298-7232. It showcases the light and sound presentation of the martyrdom of Rizal. Formerly, the marker was the Manila Cathedral. Now it marks the place where the distance is measured in the Philippines. The actual remains of Dr. Jose P. Rizal was buried in Paco. But during the American regime, it was transferred to the park and underneath the statue lies the remains of Rizal. A place worth visiting, a place where history and heritage convene - Rizal Park.